This is the perfect vegan pasta for your next meatless Monday or Holiday dinner party. The colors are festive and the flavors are insane! Even my husband, the ultimate carnivore, loved it and went back for seconds! I used Banza chickpea pasta for extra fiber and protein, but you could certainly use any pasta you like or leave it out entirely. The cauliflower and sauce alone make for a delicious side dish. 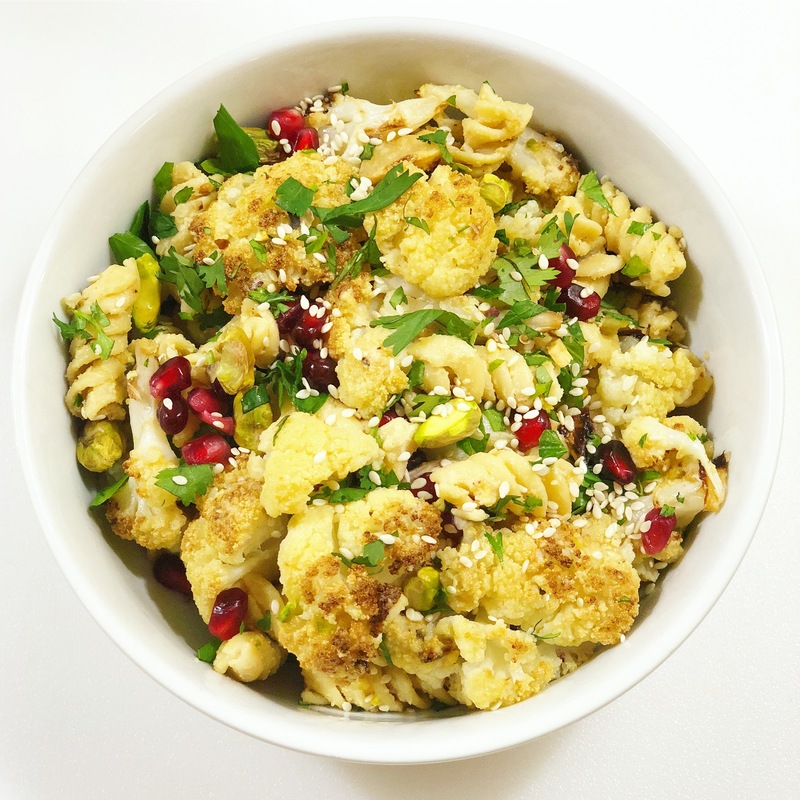 Hope you’ll give my Cauliflower with Pistachio Tahini a try and let me know what you think! Also, don’t forget to tag me in all of your foodie creations at @livlight_ and #livlight. Preheat oven to 400 degrees. Line a large baking sheet with parchment and spray with olive oil spray. Spread cauliflower florets in a single layer, spray again, and sprinkle with salt and pepper. Bake until slightly browned and crispy. In the meantime, add half the pistachios, tahini, mustard, garlic, lemon juice and olive oil to the food processor. Process until well combined and semi-smooth, adding a little warm water as needed. I like my sauce to have a bit of texture. Finely, drain pasta and add back to pot with roasted cauliflower and sauce. Garish with the leftover pistachios, pomegranates, and parsley.